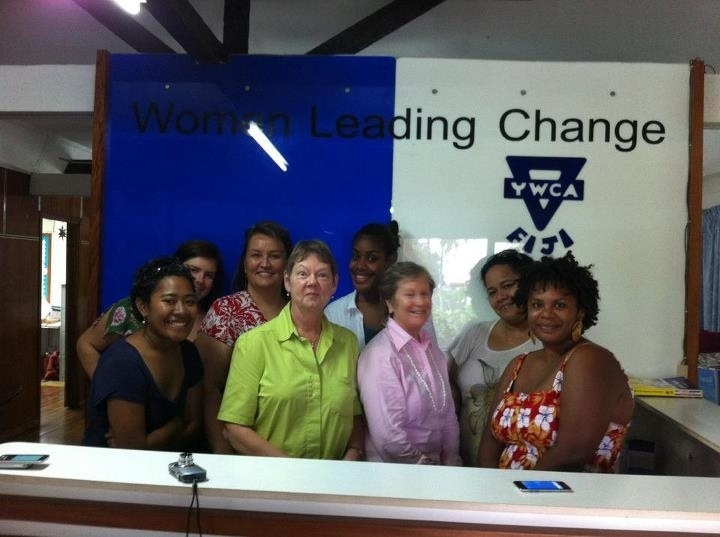 The Pacific Training Team for the Pacific Leadership Summit in Fiji met yesterday at the offices of YWCA of Fiji in Suva. 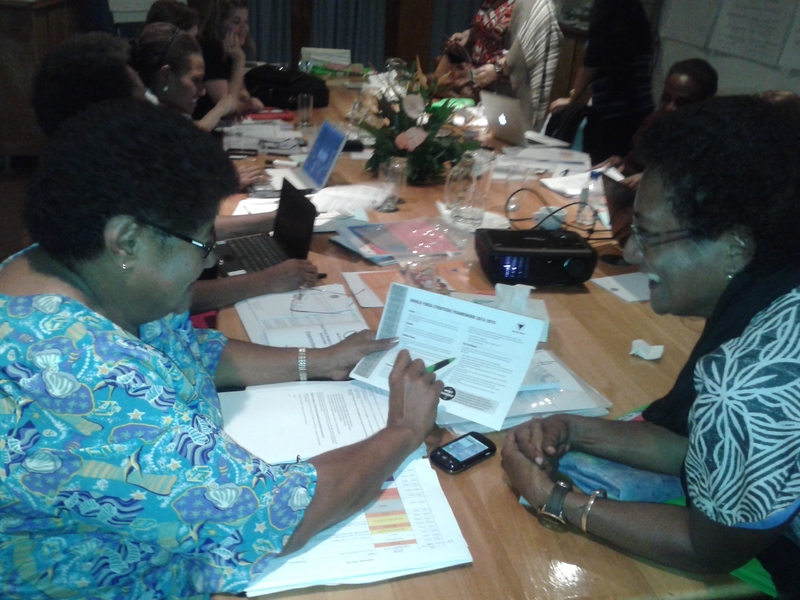 The day was spent getting to know each other better and tweaking the program for the week of leadership training for around 16 young pacific women who are arriving in Fiji on Sunday from the YWCAs of Solomon Islands, PNG, ANZ, Australia and the host nation of Fiji. A delegate from Leadership Samoa will also be joining the team. The training team of leaders (including myself) from across the region including Sina Moore from ANZ, Kiri Dicker and Julieanne Wickham from Solomon Islands, Tarusilla Bradburgh from Fiji and Juli Dugdale from the World office and the program is absolutely jam-packed. The delegates will be put through an intensive training program including information about best practice leadership programs from across the region, program design, development, implementation and evaluation and how to use a human rights based framework in your work. The week includes a field trip to services and an opportunity to pitch program ideas to potential funding bodies. It’s going to be a tough week, but loads of fun as well. Every evening includes some fun circus activities led by circus performer and trainer Cath Bateman who as managed to lug 20 hula hoops and a bag full of juggling balls all the way from Melbourne. Later in the week we will be joined by governance delegates from all the regional YWCAs who will be participating in a concurrent governance training program. We’re very much looking forward to showcasing the hard work of the young women leaders and can’t wait to see what they come up with for developing young women’s leadership in their home countries. Today was the first day of the ‘Pacific Leader’s Summit- Governance and Movement Building’ Meeting. Our day started off with introductions and each participant got the opportunity to share with everyone how they first joined the YWCA. This was quite an experience, because we got to hear some personal stories about their involvement, passion and how they all spoke about giving back to the YWCA movement. For some, the YWCA became a home away from home; a safe space that they knew they could always go back to; and even if they did travel around the world and be away for 10 years, they knew that they could always return to the YWCA. This is what the YWCA has become- A Safe Home. We were then given a brief overview of the World YWCA strategic plan, functions and programme areas and also the opportunity to hear from our Pacific Young Woman Representative to the World YWCA Board about her role and responsibilities. Overall, good governance is perhaps the single most important factor in promoting development (whether it is at the community level or at an organisational level). Governance is also about decision making, how it’s made, who is involved and how it is accounted or documented. Later in the day, we discussed governance systems, procedures and also strategic frameworks. During these discussions, one of the main things that stood out was the players or key actors in developing policies, frameworks or plans, who it needs to influence, what kind of activities is needed to be done to achieve overall objectives and who decides to carry out the implementation of these activities. Furthermore, understanding governance at the national level is made easier if one considers the different kinds of entities that occupy the social and economic landscape. Governance is not only about where to go, but also about who should be involved in deciding, and in what capacity. We also discussed the challenges of implementing plans, activities and policies. Representatives present for the Pacific Leaders Summit- Governance and Movement Building Meeting were from YWCA’s of Australia, Fiji Islands, New Zealand, Papua New Guinea, Solomon Islands and the World YWCA. So yes it was a very progressive and constructive day, I must say!